If you are getting only channels 2 through 13, most likely you have the RF cable attached to the wrong input on your TV. 1) Remove the RF cable from its current RF input and attach it to the other RF in on the TV. 2) Follow the steps for “If you are missing random channels” directly below. 1) Turn on your TV. 2) Press [Menu] on your TV remote to bring up the Main menu. 3) Press [Arrow Down] to the Channel Menu, and then press [Enter]. 4) Press [Arrow Down] to Auto Program, and then press [Enter]. 5) Press [Arrow Up or Down] to select Air, Cable, or Air+Cable, and then press [Enter]. 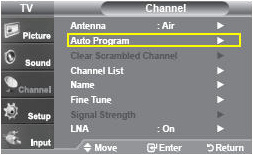 If you selected Air, the TV automatically starts the auto program. Skip to Step 8. If you selected CABLE or Air+Cable, continue to step 6. • Use the Up or Down buttons on your remote in the Analog area to select the appropriate type, and then press [Enter]. The cursor jumps to the Digital area. • Use the Up or Down buttons on your remote in the Digital area to select the appropriate type, and then press [Enter]. 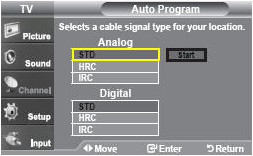 ※Note: The most common cable signal type is STD, however some smaller cable companies still use the older HRC or IRC systems. 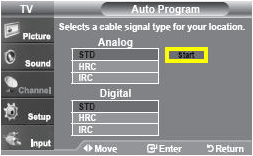 Your company uses the same cable signal type to transmit both analog and digital signals. 7) “Start” is now highlighted. Press [Enter] to begin the memorization process. 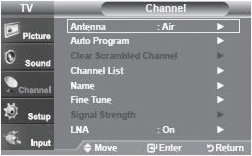 Your TV cycles through all of the channels for the antennas you selected in Step 5. 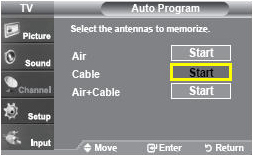 8) After the Auto Program is complete, press [Exit] to begin watching TV. ※Note: If you connected both and antenna and a cable line, you can switch between both inputs by pressing [Antenna]. If the procedures above to not resolve your problem, try the following. • Connect the RF connection to another TV and see if it works. If you do not get all of your channels, the problem lies with the antenna or cable. • Connect the TV to a different cable connection, and then repeat the Auto Program procedure. If you get all of your channels, the problem lies with the cable. • Move or rotate the antenna to improve reception, and then run repeat the Auto Program procedure. If the solution above does not fix your problem, then the tuner in your TV has failed, and you need to get your TV serviced. [TV] How can I change the language?